What do gods do when they’re not busy doing… whatever it is that gods do? Throw parties at Konohanatei, apparently. 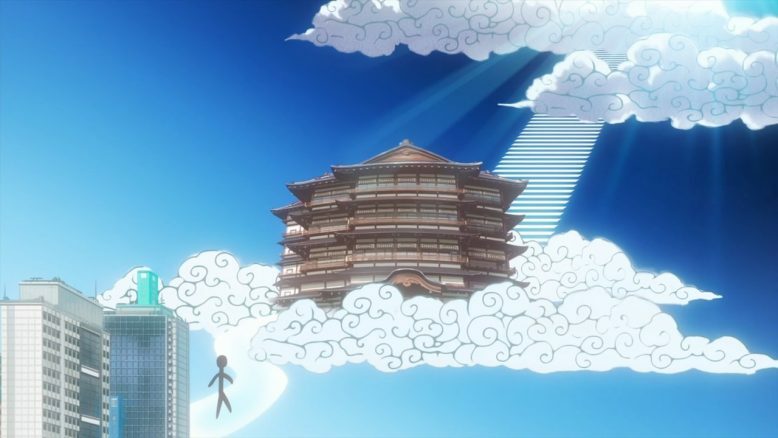 This week an assortment of unnamed (and thus, presumably minor) deities descends upon Konohanatei, and adds a bit of perspective on the state of the world. First is a fairly large, mustachioed man who is apparently Sakura’s regular customer. 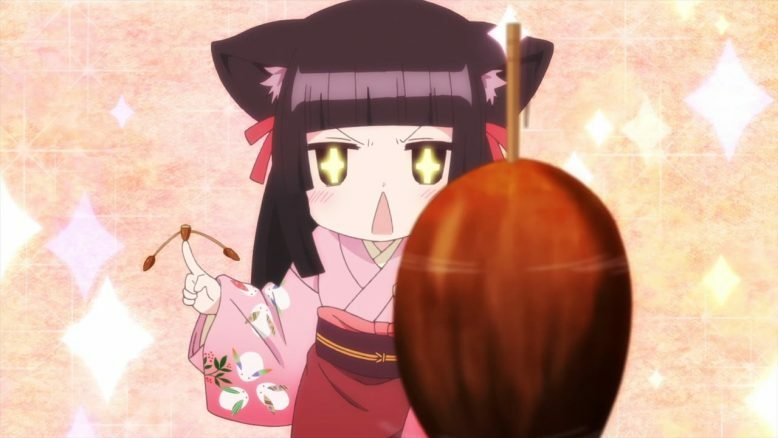 He spends his time making handcrafted toys for her out of acorns and bits of wood, which she finds utterly delightful. I have to admit, it takes some skill to be able to craft acorns into something that can balance the way he does. Not to mention making a spinning top out of one. Apparently he comes there because he enjoys being able to play with her. Certainly there can be an element of innocent delight in being able to play with a child who knows none of the worries and cynicism of adulthood. As it turns out this customer is a god of battle, but it seems that he rarely, if ever, is called to the mortal world any more. It seems the sort of wars where he would be called upon rarely happen anymore, so he has a lot of free time. It’s hard to tell if the show is trying to treat this as a good thing, a bad thing, or merely a thing. There does seem to be an air of melancholy about this man, constantly enveloped in his coat, with his face hidden, and when he speaks his tone feels heavy and lacking in cheer. Yet if he were busier it would mean people were dying in wars, and he would be unable to spend the time he likes with Sakura. 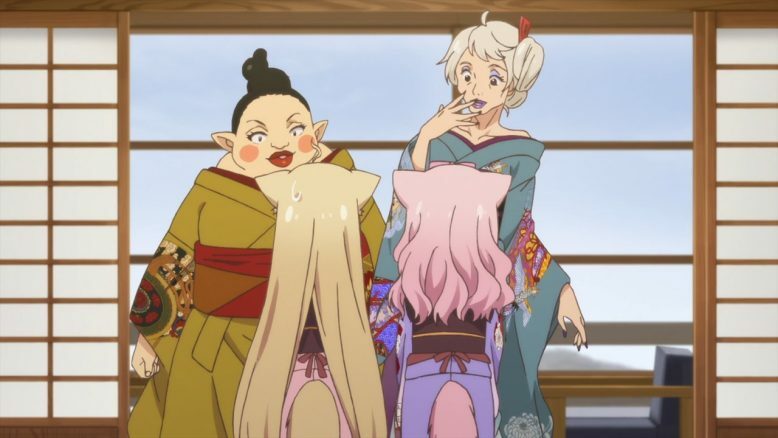 The next group of gods are Ren’s regulars: a pair of what appear to be stereotypical cross-dressing men. On the other hand, they don’t register on Ren’s anti-male radar, so whatever. It seems the two of them are gods of fashion, and they are likewise suffering form a decrease in faith. As is a fairly common theme in fantasy set in modern times, people have grown away from having faith in the gods, and as a result the gods themselves have been less and less able to interact with the mortal world. Certainly the gods don’t seem all that pleased about the situation, and neither does another interesting-looking individual who shows up and joins their party. She remembers a time when Konohanatei would regularly host large parties, with lots of travel back and forth between worlds and people stopping off in Konohanatei for a rest. For her the view from nostalgia answers the question plainly: things were better in the old days. Yuzu offers a different perspective, however. 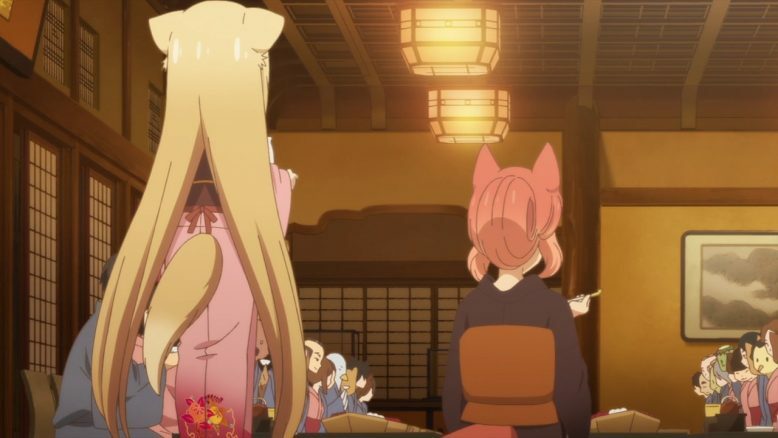 She wasn’t there in the past, so she can’t speak for it, but she believes there are forms of hospitality, ways of appealing to and soothing their guests, that can only be performed in the calmer Konohanatei of the present. As always, Yuzu’s answer is simultaneously simple, yet wise, and seems to be just what is needed. 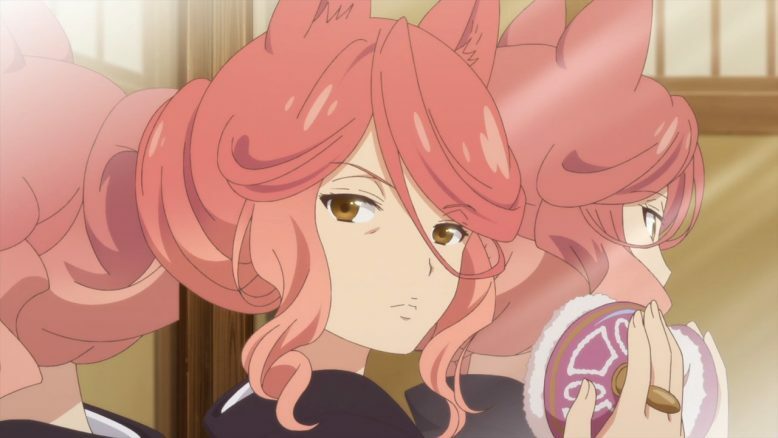 I can’t let this review go by without sparing at least a moment to comment on Okami’s makeup abilities. Can you even call that makeup anymore? Apply powder and she goes from a humanoid wolf to a human with wolf ears and tail. The girls (except Kiri who seems to have been around Konohanatei for Heaven only knows how many centuries) are just as shocked by this as we are. 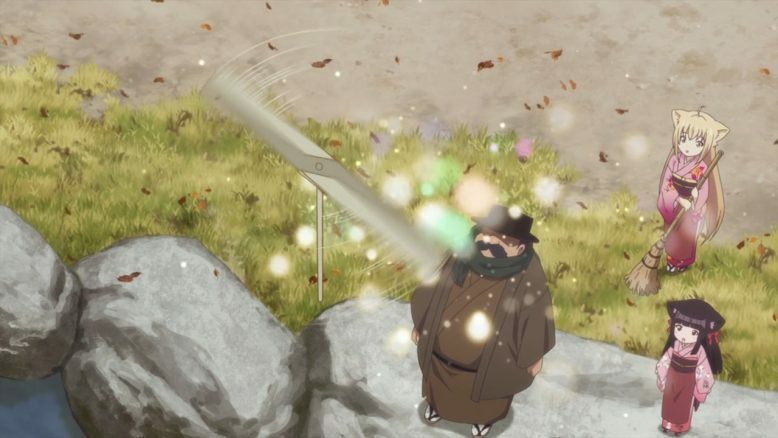 The second half of the episode gives us some much-needed focus on Okiku, who has mostly been played for one-shot gags ever since she joined Konohanatei. She’s in an odd position of being unable to help out all that much around Konohanatei due to her size, so she ends up being left out of a lot of stuff. 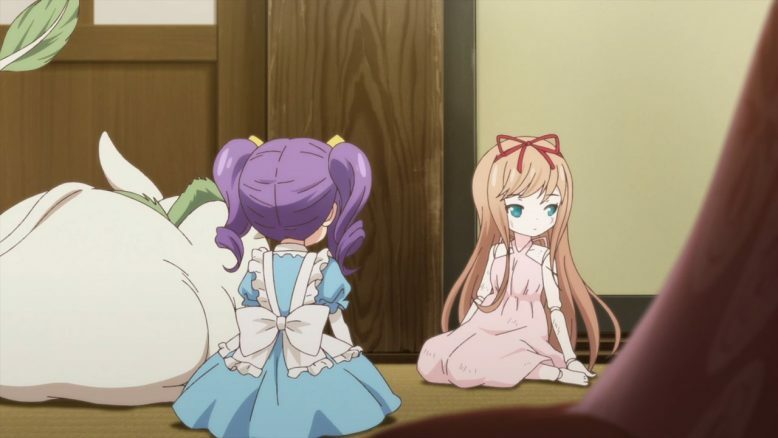 Of course, she complains when she’s made to do work, yet in this episode when the others are planning for a large reception and Okiku comes down the stairs behind them, there is an undeniable lonely air in the shot of her standing there with only Urinoske, left behind and seemingly forgotten. 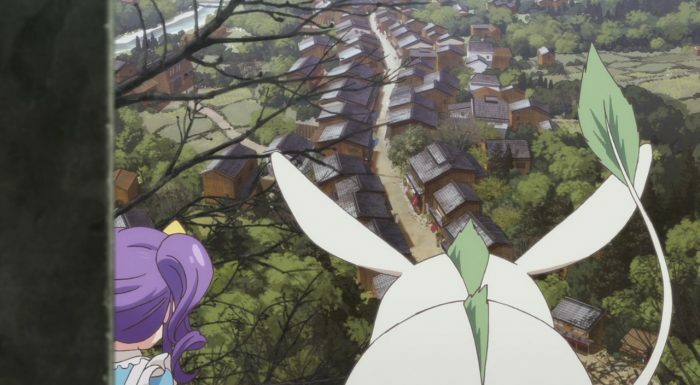 Certainly Okiku is left feeling like no one really cares if she is there or not, which prompts her to wander out into the town. And what should she discover out there, but another doll, abandoned in the garbage. Of course she brings the new girl back to Konohanatei. Okiku comes off a little strong in trying to impress the newcomer (whose name we later learn is Lily), but it feels to me like what she really wants here is a friend. 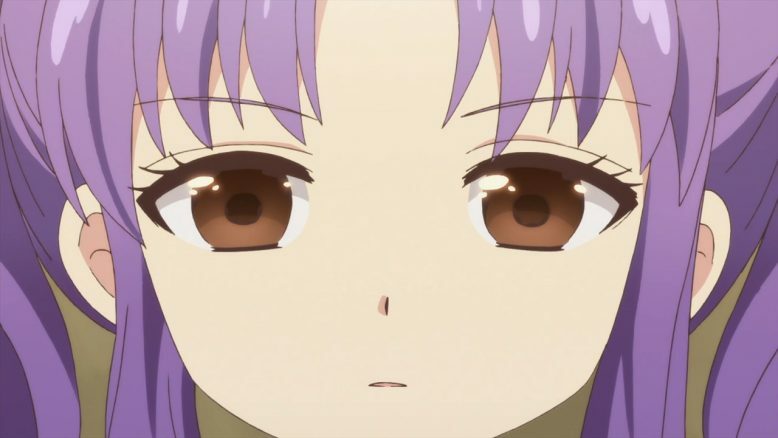 She hasn’t really formed close relationships with the girls at Konohanatei (partly due to her personality, partly due to them often being busy, partly due to Sakura… there are a number of factors), and she’s lonely. With Lily she feels there’s finally someone here who she can relate to, and who can relate to her. Of course, her attempts to impress Lily are fruitless, as the others are too busy to drop everything and help her out right now. As Okiku rages about how Humans abandoned her, Lily asks her an armor-piercing question: “You’ve never been played with, have you?” That stops Okiku cold, because indeed she hasn’t. She has never had a chance to experience the purpose of a doll. To feel what it means to be a child’s treasured companion, going through their life alongside them. To share those precious memories with someone who was her entire reason for existence. To watch over that precious person… until the time when the doll is no longer needed. 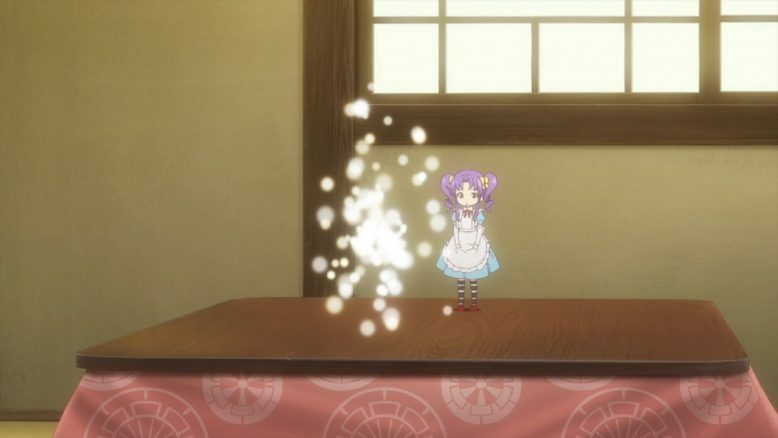 Lily’s voice is soft, yet the feelings it carries are powerful as she speaks of the end of a doll’s life. Eventually all children grow up, stop playing with dolls, and find someone they love more than their childhood toys. Lily seems accepting that that is simply the way things are, that she has fulfilled her purpose and there is no reason to be upset, but it still feels far too sad when presented like this. Certainly Okiku isn’t happy with it, and tries to plead with Lily to stay at Konohanatei and be free of all that, but Lily simply smiles and apologizes that she can’t be Okiku’s friend, before fading away in now-familiar sparkles of light. Okiku is clearly depressed as a result of this when we next see her, huddled against Ren’s back while Ren works on sewing something. She mostly mumbles non-answers to Ren’s questions before Ren finishes what she’s working on and turns to hand it to Okiku. 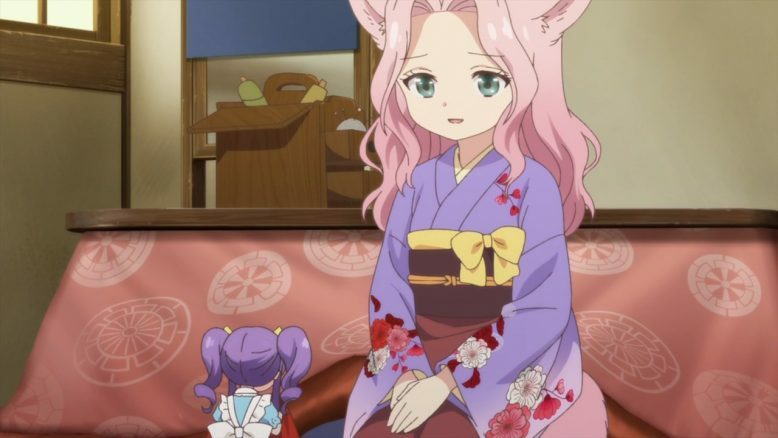 It turns out she had been sewing a furisode for Okiku to have at new years, which is why she wasn’t free to work on other clothes when Okiku asked her earlier. 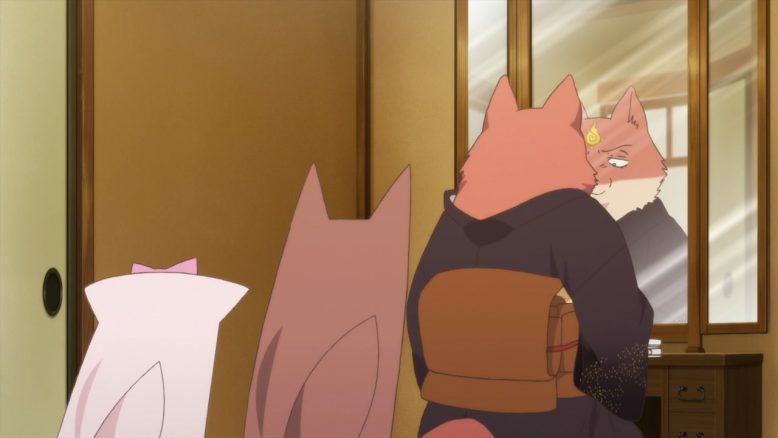 This moment is touching, because even when it seemed like the girls didn’t notice or care about Okiku’s presence, they’d actually been remembering her and thinking of her as part of their family all along. Really, I want to give Okiku a hug. I feel like she hasn’t been hugged enough in her life. 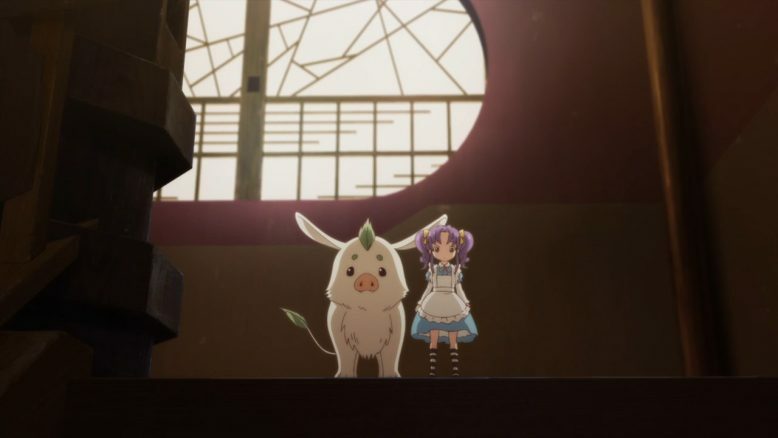 The final scene of Lily’s owner desperately searching for her and rescuing her from the garbage is really heartwarming to me. Say what you will about how it would be a “better” story if she’d just gone back to her death because that’s more “realistic,” but I’m a sucker for happy endings. Also, I like the idea that the feelings one has for the things from one’s childhood don’t have to disappear just because one becomes an adult. We’re winding down to the end of this lovely little series. Just one more episode left to go. Personally I’d like it if someone would take the anime as an inspiration to translate the manga, but regardless of that it will be sad to see this series end. I hope you’ve all been enjoying it as much as I have.